A judge in New Jersey has ruled that Republican presidential hopeful Ted Cruz is a "natural-born citizen" under the US constitution and may run in the state's primary elections in June. A group of residents had challenged the Texas senator's eligibility for the presidency. He was born in Canada to a Cuban father and American mother. But Judge Jeff Masin found that Mr Cruz met the constitutional requirements. New Jersey's Lt Governor, Kim Guadagno, is now expected to review the decision. Sen Cruz's main rival for the Republican nomination, Donald Trump, has also questioned his eligibility for the presidency. "There's a big question mark on your head," the billionaire businessman said at a debate in January. "You can't do that to the party." The South Jersey Concerned Citizens Committee and law professor Victor Williams, a presidential write-in candidate, argued in court in on Monday that Sen Cruz's birth in Canada meant he could not be a "natural-born citizen" as envisaged by those who wrote the US constitution. They claimed he was a naturalised citizen and that presidents had to be born on US soil. 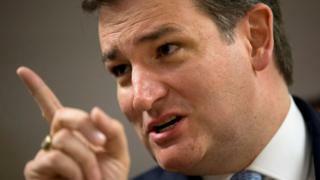 Sen Cruz's lawyer argued that he was a natural-born citizen because his mother was American. On Tuesday, Judge Masin dismissed the challenge, while acknowledging that "absolute certainty as to this issue is only available to those who actually sat in Philadelphia and themselves thought on the issue". "The more persuasive legal analysis is that such a child, born of a citizen-father, citizen-mother, or both, is indeed a 'natural born citizen' within the contemplation of the constitution," he wrote in a 26-page decision. Judge Masin added that his decision might be adopted, modified or rejected by Lt Gov Guadagno, New Jersey's secretary of state, who is authorised to make a final decision on the matter. She must transmit the names of candidates to appear on the primary ballot to county clerks by Thursday. A similar legal challenge was rejected a court in Pennsylvania, where Sen Cruz will appear on the state's Republican primary ballot later this month.